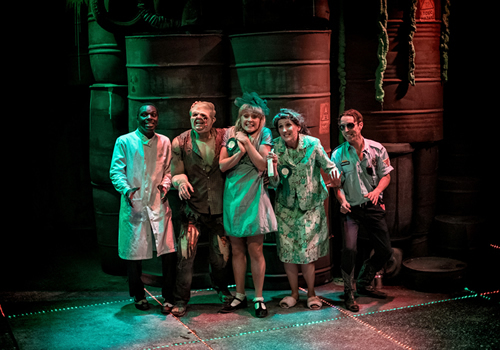 After a hugely successful UK premiere at the Southwark Playhouse last year, cult musical The Toxic Avenger returns to London for a strictly limited ten week run. Playing at the Arts Theatre, the hilarious show received rave reviews from its sold-out run at the off West End venue. The Toxic Avenger is the creation of Tony Award-winners Joe DiPietro and David Bryan, who penned successful West End musical Memphis. Based on Lloyd Kaufman’s 1984 film, the musical sees nerdy scientist Melvin Ferd the Third on a mission to clean up his city’s toxic waste. But when a corrupt Mayor vows to halt his plans, Melvin is tossed into a vat of neon liquid and transforms into “Toxie”, the Toxic Avenger. Armed with superhuman strength and a determination to rid New Jersey of toxic waste, Toxie sets out to save his polluted city and win the heart of the prettiest, but blindest, librarian in town! Prepare to laugh until you cry with songs such as “Get the Geek”, “Thank God She’s Blind” and “Hot Toxic Love”. Mark Anderson returns as Melvin/Toxie, alongside Natalie Hope as Mayor, Emma Salvo as Sarah, Oscar Conlon-Morrey as White Dude and Ché Frances as Black Dude. Further cast members include Peter Bindloss and Sophia Lewis as swings. The show sees the original creative team reunite to bring the show to the Arts Theatre, with direction by Benji Sperring, musical direction by Alex Beetschen, lighting design by Nic Farman and choreography by Lucie Pankhurst. 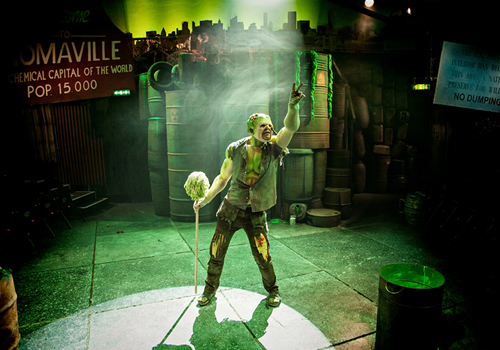 The Toxic Avenger originally premiered in 2008, followed by an award-winning Off-Broadway run in 2009. Now, the hilarious, irreverent and smash-hit musical comes to the West End, playing a limited season at the Arts Theatre from October 2nd, with previews beginning September 28th 2017. The Toxic Avenger is recommended for those aged 12 and up. Please note that adult language is used.